Bengaluru , 2014 : The most successful destination for the electronic manufacturing sector, electronica India 2014 and productronica India 2014 representing over 700 companies, showcased their state-of-the-art product offerings, solutions and services from 23rd to 25th September 2014 at BIEC, Bengaluru. The shows, widely regarded as India’s largest B2B electronics manufacturing industry and production technology fairs is being recognised as an integral part of the electronics manufacturing sector by the Associations and the industry at large. The Bengaluru edition is one of the most influential events held annually by MMI India for the electronics manufacturing industry and production technologies. The event attracts participation from electronics manufacturers, wholesalers, retailers, importers, exporters, suppliers and representatives from the trade and governmental organizations. The first day of the 15th edition of the trade fairs, held at the BIEC, Bengaluru showed a sharp spike in participation by the electronic manufacturing and production companies with over 300 exhibitors representing over 700 companies, proving once again that that despite a sluggish economy, the industry would continue to demonstrate a high level of enthusiasm to participate at the fairs. In another strong representation from the government, Shri S.R Patil Minister for Planning and statistics IT, BT science and technology (Government of Karnataka), who graced the occasion, confirmed his continuing support to the industry, at a conference focusing on Defence and Aerospace called DEFTRONICS. The Defense and the Aerospace industry also exhibited their latest technology with an exclusive stall bringing to light the country’s requirement of advanced technology in the defence sector. 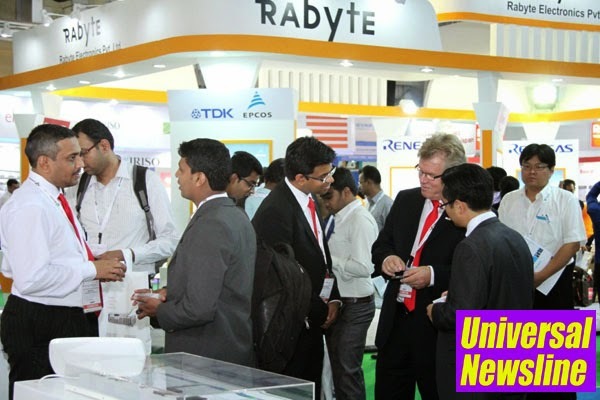 Other notable conferences of interest, by LEDCON which highlighted the key issues ailing the LED Ecosystem. The grand inauguration of electronica India 2014 and productronica India 2014 was represented by industry dignitaries and Government officials, Leading Associations, industry professionals and technical experts in the field. Some of the Key Industry speakers at the conferences included Peter Gutsmiedli – CEO at Airbus D&S India, Paul Klonowski – Global Director A&D at Analog Devices, Rahul Chaudhry - CEO at Tata Power SED, Chris Rao – MD at UTC Aerospace, Kishore Jayaraman – President India & South Asia at Rolls Royce and Ram Prasad – MD at Rockwell Collins India. The trade fairs continue to be supported by leading Associations like Indian Electronics & Semiconductor Association (IESA) Electronic Industries Association of India (ELCINA), Consortium of Electronic Industries of Karnataka (CLIK), LED products Manufacturers' Association, India (LEDMA) and others. The three day event also witnessed participation from leading manufacturers, distributors, industry professionals, apart from the Government representation. As part of its international strategy, Messe München founded its own affiliated company in India with a registered office in Mumbai, in September 2007. MMI India Pvt. Ltd. has been founded to provide Messe München with timely and competent organisational support for its increasing involvement in India. electronica India and productronica India are held in conjunction, annually. They are India's and South-Asia's leading fairs for electronic components, systems and applications along with electronics manufacturing and production technologies. Together the entire value-added chain of the electronics industry is presented. In the coming years MMI India Pvt. Ltd. will include more verticals keeping in mind its international expansion strategy. With 10 subsidiaries in Europe and in Asia - and over 60 foreign representatives covering more than 100 countries, MMI has a network that spans the globe.